Found this neat idea on houzz.com created by award winning designer Tracy Murdock. 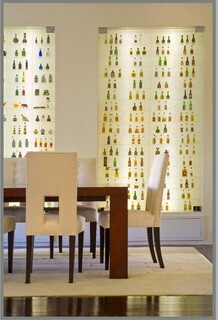 Fluorescent lights were used in this dining room space to accent a collection of rare alcohol bottles. Cabinets with glass doors were built into the walls and small shelves made of acrylic were put in place to give the glass bottles the appearance of floating. The fluorescent fixture is also covered by an acrylic lens wrapped in rice paper for a softened glow. This is a great example of a creative lighting solution that can be used to display anything. The glass bottles are especially visually enticing, given their transparency. This is a great idea if you want to display all of your top shelf bottles at a bar. Or, if you already have a display cabinet, you can assemble something like this yourself in a few hours. Simply mount a single or perhaps double fluorescent light strip fixture on the interior shelf backboard, cover it with an acrylic plastic light cover, flat sheet or wrap lens, and replace your shelves with thick acrylic flat sheets. To soften the light even more you can use any color transparent paper, or perhaps rice paper for a soft white gradient to cover the plastic light cover. Shelves come in different shapes and sizes so you may need to order a custom sized lens for your fixture. Remember, any generic fluorescent light strip fixture will work, but you will need to specify the size of the lens you will need to cover your shelf backboard. We can deliver a flat sheet or wrap lens of any size to you at your request!